It starts out by saying, "Before the Da Vinci Code was broken, the world lay at the mercy of Angels and Demons". Already notorious for his previous publications which has sent a storm in the religious world due to his personification and loose usage of facts to cast the Catholic Church as being a hypocritical organizations that only wishes to further it's power through the suppression of heretics and his use of liberal artistic license to omit or reconstruct certain facts to suit the book. 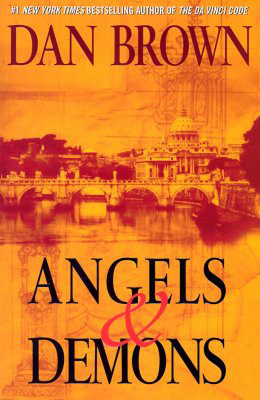 Angels and Demons (A&D) is a prequel to his other book, featuring Robert Langdon as the protagonist. Receiving word about a murder of a scientist at CERN, he is called upon for his expertise in symbolism as he faces a murder of no ordinary measure. Confronted by the words "Illuminati" branded on the chest of the victim, he has to join forces with the dead man's daughter to prevent a disaster of grand scale. Soon the shadowy organization begins it's vengeance on the Catholic Church for what they deem as past transgressions, the suppression of science and the prosecution of those advocating it. On the eve of Conclave to elect the next Pope, the four main candidates are mysteriously missing and soon both Langdon and his lady companion have to figure out how to stop the murderer with the help of the deceased Pope's chamberlain. Can they get a step ahead of the assassin with an ancient clue to the rite of passage from the Brotherhood? Can they prevent the annihilation of the Catholic capital of Vatican City? Can they beat the conspirators at their own game? Brown lays his intrigues and puzzles thick, making this book hard to put down once started. Action comes fast paced and as it is a race against time, you'll be dragged along for the ride. Mixing certain facts with fictional writing, Brown constructs mysticism, mystery, the Church and some of the most modern technology into a great book, using real locations around Rome to set his storyline. Don't be embroiled in the battle of facts over fiction, take the book as it is, a fiction entwining true religious sites in Rome with the crafting of his imaginative fiction concerning religious myths and mystery and you'll enjoy every bit of it. Twists and turns will keep you guessing who the real villain is as was with Harry Potter. Ratings 5/5.